Almost Home offers a wide variety of El Paso, TX corporate housing options for every short or long term furnished apartment need you may have. Contact us today to receive a temporary housing quote customized just for you. We wish to help familiarize potential newcomers to life in El Paso and therefore provide the following informative summary of various aspects of this city. Take a few minutes to acquire the knowledge of a long-time resident before you arrive. Those staying in corporate housing in El Paso, TX for business reasons might appreciate some information about the city’s business conditions. El Paso's economy is based on three main revenue streams. International trade, military and oil and gas form the main crux of the economy. Tourism, health care and services form a second layer to the economy. In terms of services, El Paso has a significant number of call centers that belong to various Northern companies. These call centers are located here to take advantage of the significant number of workers that man the call centers. Call centers are responsible for over 10,000 jobs in El Paso. Numerous corporate offices are located here as well, including NASDAQ listed companies, as well as companies listed on the NYSE. The government is also large employer in the area. Fort Bliss and Biggs Army Airfield are both located here. There is also the William Beaumont Army medical Center. The aggregate of military installations in El Paso contributes more than $6 billion annually towards the El Paso economy. There is additional Federal Government presence in the form of border related personnel. El Paso is the second largest border crossing facility, San Diego being first. As such, the DEA, the El Paso Intelligence Center, US Border Patrol and other Joint Task Force personnel are stationed here. Knowing what to where to your El Paso, TX furnished apartment is somewhat dependent on the local climate. El Paso enjoys a tropical climate with minimal exposure to cool weather. Spring is mild with temperatures ranging from lows of 37°F in February to highs of 70° in March. Summer is warm and humid, reaching a high of 95° in June, while Fall tapers off to between highs of 78° in October to lows of 40° in November. Winter stretches from December to January, with the coldest of 32° occurring in January. So, be sure to dress right and then venture out of your El Paso, TX corporate apartment to enjoy the wide variety of outdoor activities that this area offers. Being a temporary resident in El Paso, TX corporate housing need not relegate you to feeling like a complete outsider. Acquaint yourself with El Paso’s history by reading our brief historical summary provided below. Pre-European cultures here form a complex history in the area. Prior to the Spanish arrival, numerous tribes occupied the area from as far back as 3000 years ago. Among them were the Manso, Suma and Jumano tribes as well as the Apache. There are some indications that the earliest expedition that passed though here was the Navarez Expedition in 1530; however, there is no concrete evidence of this. In the mid 16th century Don Juan de Onate was the first in recorded history to explore the Rio Grande River near present day El Paso. Interestingly, he set up camp and thanksgiving celebrations at the current El Paso location. The city's major growth occurred after the Civil War. More Texans began moving into the area and the dilution of the Hispanic cultures continued. Eventually, the Texans became the majority in the area. This coincided with the city descending into disarray and lawlessness, being nicknamed the Six Shooter Capital. The Garden on Western St: The Garden sports a relaxed and romantic atmosphere coupled with good food and friendly waiters. There is convenient parking in the rear and minimal wait for a table. The food is served in a sophisticated environment; but they do accommodate the entire family, including the kids. Crave Kitchen & Bar on Cincinnati Ave: Crave Kitchen & Bar offers generous portions, good taste and wide variety. Servers are friendly and accommodating. There is minimal wait for a table on weekdays, although it gets crowded in the evenings and weekends. One favorite here is the Marshmallow Dip with Sweet Potato Fries. KiKi's Mexican Restaurant on N Piedras St: This is an authentic Mexican restaurant. The favorite among regulars here is the Machaca Burrito with green sauce. State Line on Sunland Park Dr: This place is famous for its ribs and chicken. The kebabs are also well liked by the locals. The service is prompt with full attention to detail and the servers are very friendly. They accommodate just about any request you make. Pot Au Feu on E Franklin Ave: Pot Au Feu celebrates perfectly flavored food. The menu is loaded with numerous choices and the variety is diverse. Stepping out of your El Paso, TX temporary housing is bound to present you with numerous interesting activities. We have listed a few possible entertainment options that may appeal to you. Museum: The El Paso Museum of Art in the Arts Festival Plaza has number of different exhibits every year. From Baroque are the Southwestern designs and contemporary sculptures, the experience is unique and rather pleasurable. The museum is open every day except Mondays and public holidays. Theater: The El Paso entertainment scene is divided across four venues, the El Paso Convention Center, The plaza Theater, The Abraham Chavez Theater and the McKelligon Canyon. Between them, you will find shows performed by Moscow Ballet, Disney on Ice, even stand-up by people like Bill Cosby and musicals like Jersey Boy. Shopping: The Cielo Vista Mall is a one-stop-shopping destination that has all the usual shops including Banana Republic, American Eagle, Bebe, Sears, JCPenney, Dillard's and Macy's. Golf: The Butterfield Trail Golf Club has a classically designed course playing 18 holes. The Iron Tees play a total of 7307 yards with a par 72. This is an award winning course that displays many of the local flora and fauna as well as undulates over 55 feet of elevation changes over the 18 holes. Parks: The Franklin Mountain State Park on McKelligon Canyon Rd is a great way to enjoy the unique geography of this area. You can still see coyotes in some places here, and the walking trails have exotic plants along the way. There are trails that go up the mountain for a more vigorous workout. 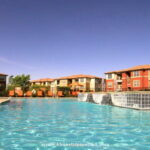 Whatever your reason for visiting El Paso, Almost Home Corporate Housing is your best choice to provide you with a furnished apartment in El Paso, TX that is perfectly suited to meet your unique housing needs. Call us today to receive a quote or fill out our simple housing request form at the top of this page.